Last week I was very lucky to be the recipient of a bag of quince. The donor was Mary-Ann Time To Cook, one of the 3 finalists from The Great British Bake Off GBBO. We had lunch together and when I arrived Mary-Ann handed me my bounty and I left it in the boot of my car while we ate. On returning to the car I was met with the most glorious perfume. 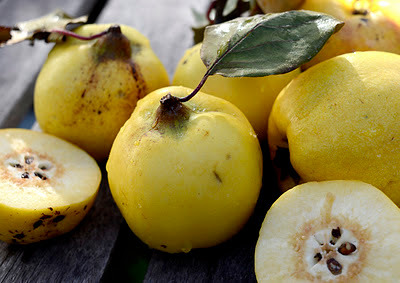 Quince has a sweet honey like scent like nothing else, it is neither apple nor pear but something in between and when made into a jelly is the colour of rose tinted amber. My recipe is not very precise for this. I did not weigh the fruit but measured the liquid it produced. You need 500g of sugar for every 600ml of liquid. 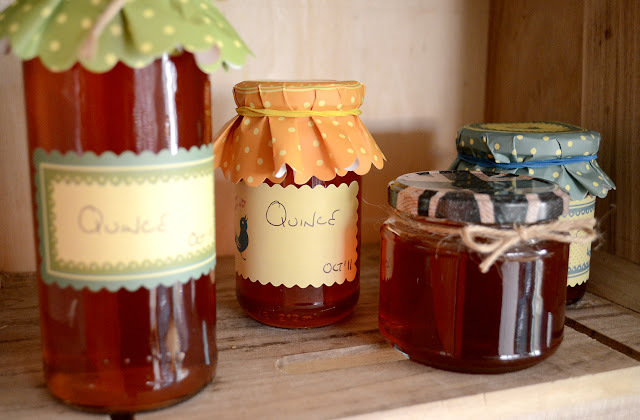 Quince has a high pectin content so should set easily but if you have the fear of not setting you could use a jam sugar which has pectin added to be on the safe side. Fill your largest pan with the fruit cut into chunks and add a lemon cut in half. Next add enough water to just cover the fruit and bring it to the boil. Once it's boiling, leave it to simmer until the fruit is soft and mushy. This should take about an hour but don't worry if it takes longer. Give it a stir from time to time to stop it sticking and burning on the bottom. Now you need to strain the liquid from the mush. If you have a jelly bag - lucky you. I have no such thing so used a pillow case hooked on an upturned stool with the cleaned pan underneath. Leave it to strain over night to ensure you get every last drop. My carrier bag gave me just under 1200 ml so I used 1kg of sugar. Add the sugar to the pan and boil till you reach setting point. You can use either a jam thermometer for this or test a teaspoon of the jelly on a chilled saucer. I usually put one in the freezer before I start boiling. Leave it on the saucer for a minute then run your finger through it, if it forms a skin which then wrinkles, it's ready. Pour your jelly into sterilised jars and feel very smug that you have just made something very tasty indeed while you listen for the pop pop popping of your lids. I sterilise my jars by washing them in warm soapy water then put them into an oven at 100C till they're dry. Use them straight away once they're out of the oven. I put the lids in a pan and boil them in water for 5 minutes. Thanks Mary-Ann Time To Cook Now, where's the cheese? They're great aren't they, not enough string in the pack though. They look good on your Lemon Curd. Beautiful jelly! I recently made some pretty pale pinky-yellow plum jelly and looove how pretty it looks when the sun shines through. Never cooked quinces before, in any format. You're right Kavey, the colours you get with Jellies are great. Plum sounds good, I think Quince are harder to come by. 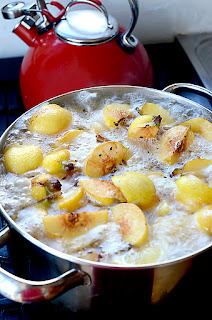 I have used quinces to make membrillo before - it was hard work and I think I should have just made the jelly! 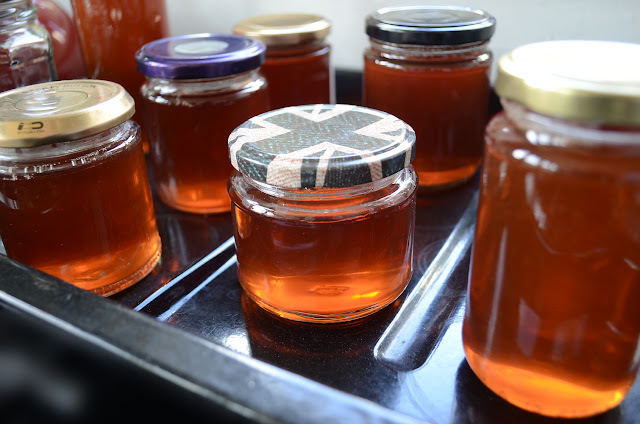 I did make apple jelly this year, which came out the same beautiful amber colour. It almost looks too pretty to eat! like yours with a few simple tweeks would really make my blog jump out. Also see my website :: Real ideas to make money and save money!